Discount Maui Jim Cyclone sunglasses online means cheap designer sunglasses at affordable prices. These are great Maui Jim prescription sunglasses i.e. RX able, at seriously discounted prices. 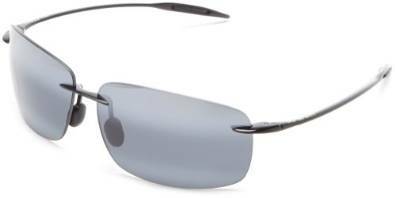 One of the most attractive of the Maui Jim prescription sunglasses range is the Cyclone. There are a number of features that make these glasses a great buy for anyone. Some of the more noticeable features that you'll find on these general use Maui Jim sport sunglasses are the stylish tortoise colored frame, the fashionable looking frame and lenses, polarized and UV protected lenses. The frame of these activewear sunglasses is made with a strong and durable nylon material that is made to withstand high impact force. This means that your shades are going to last longer and stand up to wear and tear much better than many other sunglasses will. When you pay this kind of money for sunglasses, you want them to last, right? This is why they are made with only high quality materials. These polarized sunglasses are perfect for just about any outdoor activity whether it is a sporting activity or one that simply involves driving around town in your car or truck. They look and feel great in virtually any situation. The polarized lenses are very effective at reducing the amount of glare that you get from reflective surfaces such as blacktop, water, or windshields. Maui Jim sunglasses are very well known for their highly polarized lenses. You'll also enjoy the convenience of a hard case when you purchase a pair of Maui Jim Cyclone shades. The hard case can help keep your sunglasses protected while they are stored in your glove compartment, purse, or wherever it is that you keep them stored. These Maui Jim prescription ready sunglasses do not come equipped with nose pads, but the frame is constructed so that the nose pads are built directly into the frame itself. The smooth material of the frame and the contouring makeup of the frame creates a very comfortable fit on any type of facial structure. These glasses are made with high quality scratch resistant lenses that are 20% thicker than most other lenses on the market. When it comes to style, comfort, and durability, Maui Jim sunglasses are difficult to beat.